Friends, Romans, Baking Enthusiasts: Lend me your ears! …. Who wants to make Pompeiian Bread? If you do then you’ve come to the right place. Many of us have seen the iconic images of carbonised loaves of bread that were excavated from Pompeii, Herculaneum, and other settlements in the Bay of Naples (Italy), that were destroyed during the eruption of Mount Vesuvius in 79 AD. But have you ever wondered what that bread might have tasted like? How was it made? What ingredients went into those loaves? What is that funny-looking, sectioned bread called anyways? It’s called ‘Panis Quadratus‘, my friends, and historically it is one of the most beautiful representations of food ever found in the archaeological record. Named because of the four linear ‘cuts’ made to the loaf, creating eight evenly distributed sections that were cut into the loaf prior to baking, ‘Panis Quadratus’ was represented a great deal in the archaeological record at Pompeii both in art and in artefact. The reconstructed recipe for Panis Quadratus below provides an opportunity to explore the history of Pompeii and Roman food culture further by using a very appropriate sensory avenue: taste. We’ll also familiarise ourselves with the baking labour process by getting our hands dirty, using some good old-fashioned elbow-grease, and making this loaf from scratch from start to finish as we add our own creative touches. If you read the first part of this two-part series on Roman bread-baking (Baking Bread with the Romans: Part I – Pliny the Elder’s Leaven) then you may have already made your own leaven (also known as bread starter, yeast, sourdough starter, pasta madre, levain) which is called for in this recipe. If you have not been able to make your own leaven yet, you can return to the first article and give it a try or you can buy your own. It’s often possible to find starter for sale at your local bakery or grocery store. But before we roll up our sleeves and tie the donkey to the quern-stone, let’s have a bit of history first, shall we? The history and destruction of the ancient city of Pompeii is a topic that has captured the hearts and minds of historians and archaeologists for hundreds of years. There is a tragic and romantic aspect to the manner in which the city and its population met its demise, during a catastrophic volcanic eruption in 79 AD, which creates a strong desire for many to learn more about the site and the people that inhabited it. Mount Vesuvius took thousands of lives on that fateful day in 79 AD and buried several settlements, not just Pompeii, in ash, pumice and pyroclastic flow. The result was a horrific event that essentially created an invaluable archaeological time-capsule along the eastern Bay of Naples preserving many impressions of Roman daily life for many future generations to study. Pompeii alone hosted a population of approximately 12,000 people on a grid covering almost 66 hectares of land; it is now widely accepted to be the most important archaeological site in the world. Now, if you are like me, you probably enjoy reading about Pompeii or studying the endless sources of Classical historical data that the site has to offer. If you’re just starting out on this voyage of discovery, you’re in for a beautiful ride. But if you’ve already put your toe in that water you’ll have also realised that ‘studying Pompeii’ is something that you will be doing for the remainder of your life. There is no end of research, discovery, theory and interpretation that can come from studying Pompeii, or Herculaneum, for that matter. There is also no end to the avenues of study that you can choose from once you dig a bit deeper into the material culture that the ancient ruins have to offer: architecture, art, civic infrastructure, engineering, construction, epigraphy, ceramics, metallurgy, trade, sociology, theology, politics, and foodways. Each one of these avenues of Pompeiian history tells us a great deal about daily provincial life in the Roman Republican and early Imperial periods. The area that I enjoy researching the most at Pompeii, of course, is food. Food-related archaeological data conveys a great deal of information about people and their daily lives; it can also tell us a lot about other objects or contexts in an archaeological setting. Food can provide insight if radiocarbon dating is used, for example, to date organic food residue, or we can use food remnants themselves as a relative dating tool to contextualise other objects found in the same environment. For example, closer examinations of food remnants related to the Vesuvian eruption recently resulted in a challenge of the eruption date of August 24, 79 AD. Some archaeologists now believe that the eruption occurred later than the currently accepted date. Here’s why: Preserved fruit and nuts that were examined further were known to have been ripe in the autumn and wine-making processes in ceramic dolia were found to have already been underway by the time that the eruption had occurred. All of this new food-related data thus connoted a harvest, or autumnal time-frame for the eruption, over that of a late summer date. This debate is still ongoing but it is fascinating to see how food-related archaeological data from Pompeii and the surrounding areas can contribute to understanding the bigger picture in so many ways. What fascinates me the most about Pompeii and the daily lives of its residents was its love of bread. In fact, if you gave me a huge research grant and a lifetime supply of water and sun-screen, you’ll likely find me camped out, alongside Enzo the stray dog, in one of Pompeii’s thirty-five bakeries. Why? 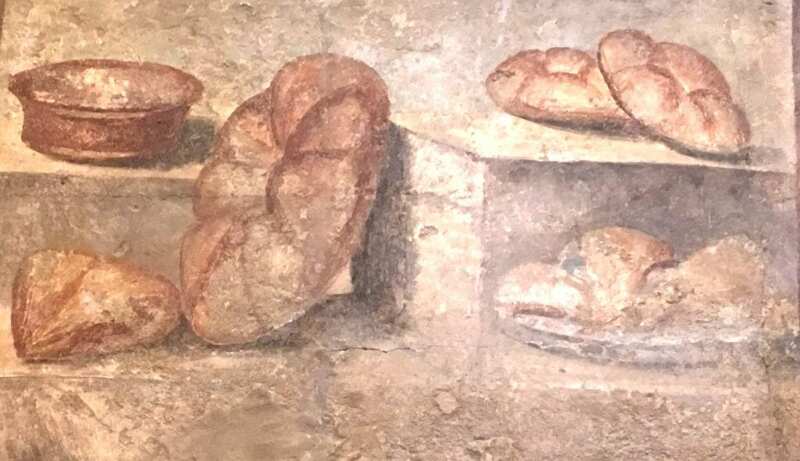 Because bread was the backbone of Pompeii’s daily diet; the bread bakers were powerful people in Roman society; and the bakeries themselves are incredibly telling and sensory environments. You see, bread was a critical commodity at Pompeii. 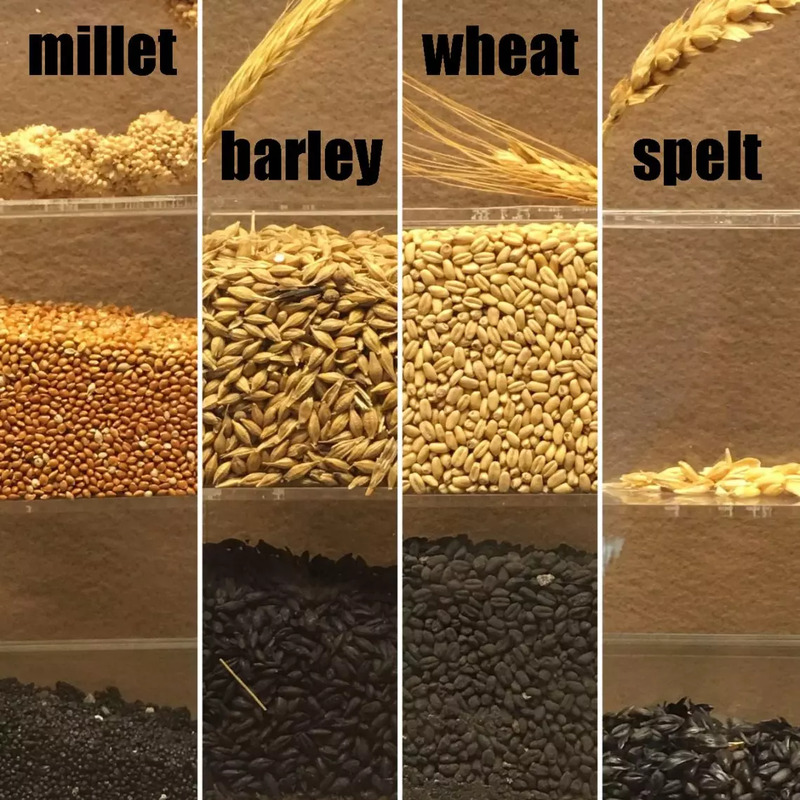 It required massive quantities of grain, fire-wood, and slave and animal labour to produce a daily supply to feed 12,000 people. Donkeys walked in circles tirelessly, for hours on end, rotating the quern-stones (grain-mills) that ground the wheat; slaves did the same when animal-labour was not possible. The ovens were fired around the clock and enough grain had to be imported from within the region or from provincially confiscated territories to supply the Roman people with their daily bread. Bread was prepared daily, in high volume, often in the home but mostly in commercial bakeries run by a Corpus Pistorum (or Collegium Pistorum): a veritable trade-union of powerful bakers who were likely looked upon as a Roman version of the ‘Hoffa teamsters’ of the day. The men who controlled the bread and the commercial ovens often ran for office or influenced civic elections themselves. A common saying of the day was to say that a baker ‘gave good bread’, ‘bonum panem fert’, which meant that he could be a trusted community member or a potential civic official. To understand the power that bakers once held in Imperial Rome, all one has to do is stand in the shadow of the enormous tomb of master baker Marcus Vergilius Eurysaces that was erected outside of Porta Maggiore in Rome during the 1st century BC. Professional bakers in Rome, and in Pompeii, did not exist until the 2nd century BC and it is theorised that this advancement in specialised crafts has everything to do with the conquering of Macedonia for the Republic by Aemilius Paulus. It is also assumed that Pliny the Elder’s reference to Greek knowledge of leaven indicates that yeast likely became a component of Roman bread-making during this time as Greek bakers were employed in Roman settings: “The Greeks have established a rule that for a modius of meal eight ounces of leaven is enough.” (Pliny the Elder, Historia Naturalis – Book XVIII-26(11)). This also suggests that the advent of leavened bread-making by the Romans in the 2nd century, despite the feelings of disgust or impurity that ‘putrefied and rotten dough’ invoked in many, brought bread to a whole new level of social and dietary significance. Salt in Bread Dough: “At the present day, however, the leaven is prepared from the meal that is used for making the bread. For this purpose, some of the meal is kneaded before adding the salt, and is then boiled to the consistency of porridge, and left till it begins to turn sour. In most cases, however, they do not warm it at all, but only make use of a little of the dough that has been kept from the day before.” (Pliny the Elder, Historia Naturalis – Book XVIII-26(11)). Leaven (or starter) after feeding. Note: Before you start this recipe, make sure that you’ve fed your leaven (starter) 8 hours prior to mixing. You can do this by feeding the main starter or by creating a sponge (an off-shoot of the main starter) in a separate bowl. I like to feed my starter using two parts flour and one part water. It seems to result in a good stable consistency. Aim for a greek yoghurt-like consistency, not a watery consistency. You can feed the main starter 1 cup of flour and half a cup of water and leave it sit covered for 8 hours, for example. Or, to make a sponge, take 1/2 cup of starter out of the main container and add 1 cup of flour and half a cup of water. If you end up with more than a cup of starter in your sponge, put the remainder back in with your mother starter. Step 1. Mix and autolyse: Combine the water and leaven (starter) together in a large bowl and mix it gently with a spoon or whisk. Mix the flour and salt together in a separate bowl and then combine with the liquids. Mix the wet and dry ingredients together by hand or in a mixer. Cover and let stand for an hour (autolyse). Step 2. Stretch and folds: After the 1 hour of autolysing (initial mix-and-sit phase) take the dough out and punch it down gently with your finger-tips on a clean surface. You’re going to stretch-and-fold the dough four times at 30 minute increments. This step allows the dough to strengthen and rise as the gluten structure forms. You’ll notice that with each stretch-and-fold the dough becomes more elastic. Use a timer if you want to remind yourself of when the next stretch-and-fold step takes place. For each of the four stretch-and-folds you can treat the dough like a ‘square’. Take one side, or one corner, and pull it over towards the opposite side as in the image to the left. Do this for all 4 ‘corners’ or ‘sides’ of your dough. After each stretch-and-fold, cover the dough using a clean tea-towel or an overturned bowl and leave it sit for 30 minutes each time. Do this step four times! Step 3. Once the four-step stretch-and-fold steps are complete, shape the dough into a ball. Try to gather the seams underneath the loaf so that the top of the loaf is smooth. Take the tray or dish that you’re going to bake the loaf in and dust the bottom of it with a coarse ground flour or whole wheat bran. Place the shaped loaf into the baking dish. Step 4. We’re going to follow a popular theory and use baking twine to create the linear grove along the side of the loaf. It’s difficult to say why the groove is there and how it was originally made but it does not appear to have been made by the lip of a circular baking pan, as the loaves are often misshapen or bulbous below the groove as well as above it. It seems logical that something was corded or ringed around the loaf so we’ll try this method to create the groove although I am not certain that twine would have made an efficient or cost-effective choice for the original bakers. Take the baking twine and measure enough to encircle the exterior of entire loaf at the mid-section leaving ample length left over to tie the twine into a bow. See the image to the right for an example of what it should look like. If the twine is of the thinner variety, double it in length. Don’t tie the twine too tightly around the dough, give it a bit of room but not enough for it to fall to the base of the loaf; the dough is going to rise around the twine creating a defined lateral groove along the side of the loaf. Once you’ve secured the twine and tied the bow, cover the loaf with a tea towel, and place it in a warm place in your kitchen to rise. Step 5. Dust the top of the loaf again with the coarse flour or wheat bran that you used to line the baking dish. Get the sharpest knife in your kitchen (or a bread lame) and score the bread making four linear slashes, creating eight even sections on the loaf. We’re going to score this in the same fashion as we see the bread sectioned according to the archaeological record; see the images to the left and below as examples. Now, we can debate whether these sections were made by a knife, by a cutter, by a blunt instrument, or by twine but it is difficult to determine this from the carbonised loaves that have been excavated. It is possible that the original bakers may have used twine to define each of the eight sections of the panis quadratus but it does seem like a fairly intricate and tricky job to complete, requiring knots or loops at eight junctions on a cord that would encircle the loaf horizontally. For this recipe, we’ll use a knife. Making four slashes through the top of the loaf, cut approximately 1 cm deep into the loaf. There’s no need to go any deeper as the loaf will rise again a bit more during the initial baking process and create a nice score. Step 6. Now we’ll work on a final added detail that will make this loaf of Roman bread a fait accompli: we’ll give it a bread stamp. Using a cookie cutter, a pasta stamp, or any clean circular, square or rectangular cooking implement that you have, gently press a depression into one of the sections with it. As I do not have a bread-stamp, I have chosen to use a few pinoli (pine nuts) to fill in the circular depression that I have made using a small cookie cutter. Step 7. Let the dough rise now until it has risen to twice its size. The length of this part of the process is entirely dependent on the temperature of your kitchen and the humidity of the climate in which you live. It could take two hours or it could take 4 hours. Cover the loaf with a clean tea-towel or put it inside of an air-tight proofing environment. Keep an eye on the loaf and take note once it has doubled in size and the twine becomes embedded in the side of the dough. Make sure that the dough doesn’t sit too long and expire; this is where getting to know your own starter comes in handy. The more you bake with your starter, the more you’ll know how long it will go in the rising process before it expires and the loaf deflates. For a dough with this much flour, my starter has a life of approximately 8 hours from autolysing to baking time. So I try not to let the whole process exceed seven hours. Step 8. Once the bread has risen fully, preheat the oven to 400 F / 200 C / Gas mark 6. Place a small pan of water in the oven as you preheat it and leave it there throughout the baking process. It will create humidity in the baking environment that will allow for a bit more oven spring as well as a durable and chewy crust. Give yourself a pat on the back and a nice mug of mulsum! You’ve done it. You’ve baked like a Roman! Now to tasting the bread: Get in there like a legionnaire and break the loaf with your bare hands and try pairing it with some other Roman flavours. Pairing this panis quadratus with accompaniments such as honey, strong olive oils, pepper, milk and fresh cheeses will bring out the sweet and earthy flavours of the wheat and bran as well as the tangy flavour of the starter. It’ll give you an opportunity to taste what it was the Romans tasted when they ate their daily bread during cena (dinner) or at dawn during ientaculum (breakfast) as they began their days. The end result for this recipe is a stunningly beautiful loaf of Roman bread with rich flavours and a textured crumb that is on the slightly heavier side. There is something so enjoyable about making this recipe as well: It’s a lesson in good old-fashioned, honest hard work; it’s meditative; and it’s historical. Finally, the pay-off is just magnificent. This recipe for panis quadratus is something that I will be baking regularly in my home especially for special occasions. It’s steals the spotlight on the table and goes well with every meal be it breakfast, lunch or dinner. When I broke my first panis quadratus open, I swear that I could hear someone whisper ‘bonum panem fert‘ in my ear… I give good bread… But then again that might have been the mulsum talking! Cena bene and good baking to you! Did you try this recipe at home? If so, please feel free to leave questions, comments or suggestions below. You can also join the conversation and share photos on the Tavola Mediterranea Facebook page or Instagram page. Hey! I am making this with a friend for our Latin class. I was wondering what kind of pan do you recommend for baking it? Hi Haley! I would use whatever you have available to you as most folks won’t have a brick oven to bake it in. If you have a baking stone or a large ceramic baking dish, that’d work the best. If you have access to a large commercial oven or a ceramic or brock outdoor oven, just slide it onto the base of the ovem with a pizza or bread paddle. Post pics on the Facebook page too! I’d love to see how it turned out. I duplicated the groove around the edge by placing a disk of one half the dough on tip of another. I think that this is the simplest explanation. All of the others seem complicated and to no purpose. The finished loaf looks just like the ones in the mosaics and, taking into account the carbonization, the one from Pompeii. Since it doesn’t appear that I can post photos, I will PM them to you. Hi Jeff! Go ahead and post this to Facebook. The photos area beautiful! I am making the recipe with my daughter for her Roman homework project. Separating the dough into two discs makes perfect sense, but when you say you docked the risen loaf, does this mean after the final proving directly before the loaf goes into the oven? I have only made bread with shop bought yeast before and would usually carefully make a shallow cut in the top of a loaf after the final proving to help it expand in the oven. I’m concerned if I cut it all the way through at that point I will knock all the air from the bread and end up with a discus! The band serves to restricts the spread of the dough in the oven – forcing the dough to rise upwards, rather than out to the sides. The less a loaf spreads outwards, the more loaves a baker could fit into their oven, which might make the extra work/expense of applying the string/band worthwhile. So many of these things start out as practical applications but evolve into stylistic choices – perhaps the string was once a necessary requirement but evolved into a aesthetic application as changes in backing technologies and the grains available might have made the string-as-band redundant? Hi, I just saw this video — is it possible they just cut the bread around, there was no string involved? What a great article! Thank you for this. So much information. I’ll be using the expression “gives good bread” as soon as I get a chance. larsiusprime at Hacked News suggests that the top and bottom were two separate balls of dough stacked on top of each other, explaining the groove. The Byzantine Prosphora is similar. When Rome was sacked, people moved to Byzantium (imagine if California was bombed and people moved to New York). Byzantines still called themselves Roman. I think it’s probable that the same bread-making methods would transfer to their new capital. Great article. Really enjoyed reading it. ? Could the string have been used as a way to ensure size consistency? The string would then be pulled off after baking and reused. This recipe was such fun to make. The kids loved getting thier fingers in helping make the bread. Trying to picke the next recipe from this site to make. Trying to find the tomatoe and rice one but still looking. Having baked my own bread for four decades a couple things seem obvious to me. Tying the string around the loaf may well have been useful for cooling and storing the loaves as well as transporting them neatly and in an orderly and compact fashion to the customers who ordered them. The string groove also suggests that after breaking or cutting the wedges apart it would create a hinge like fold which would facilitate the opening of the wedge from the pointed end and filling it with some other food as if it was a small pie (sandwich). I like to imagine the children running out to meet their friends with a wedge of stuffed bread in their grubby little hands. Is it possible that instead of a single loaf, the dough was divided into smaller portions and then all tied together with twine to create a whole loaf out of parts? That would explain the divisions, and the groove from the twine.